Bloggers4UKIP: Hope not Hate selling leaflets saying that UKIP want to "get rid of the NHS"
Hope not Hate selling leaflets saying that UKIP want to "get rid of the NHS"
Hope not Hate, the Labour Party's propaganda arm paid for by the trades unions, is trying to raise £3k to print 150,000 leaflets telling lies about UKIP wanting to privatise the NHS. Nick Lowles, the former Communist Party of Great Britain and Socialist Workers Party activist, has sent an email out to supporters telling them that UKIP wants to "get rid of the NHS" because Nigel Farage said we will need to think about private health care in the future, because Paul Nuttall said the NHS stifles competition, because Matthew Richardson said the NHS wastes money and because Neil Hamilton said the NHS is a more effective killing machine than the Taliban. He doesn't say that none of this is party policy because the membership doesn't want it and UKIP is a democracy, instead he repeats Labour's lies that UKIP wants to abolish the NHS. 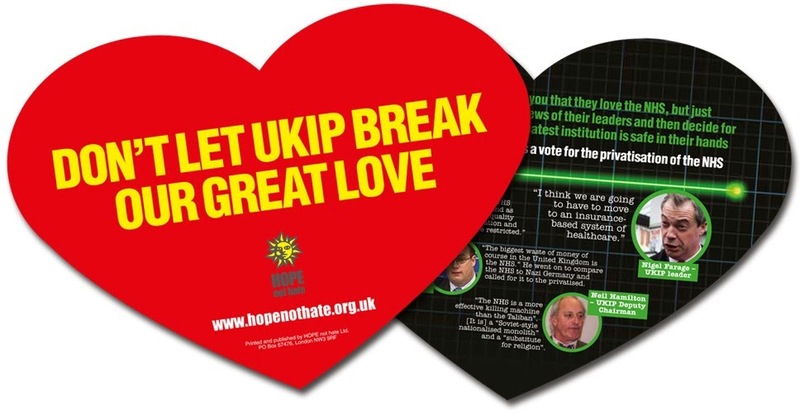 Hope not Hate is funded almost entirely by the unions and by selling Labour Party propaganda to ignorant people who are too dim to realise they're being conned by confidence tricksters.